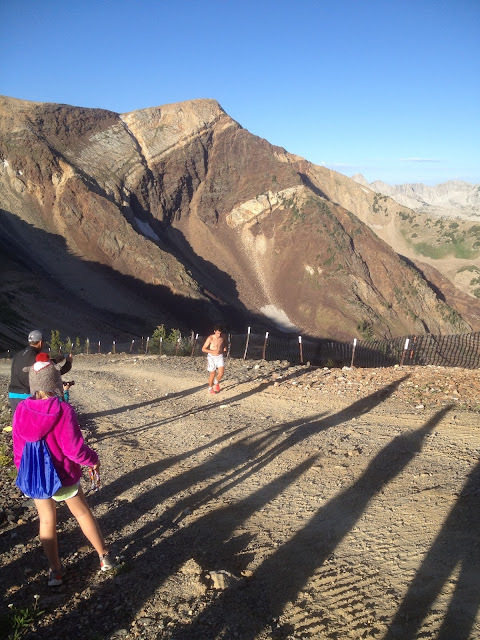 This past Saturday Snowbird UT saw ultra legend Karl Meltzer's SpeedGoat 50K. 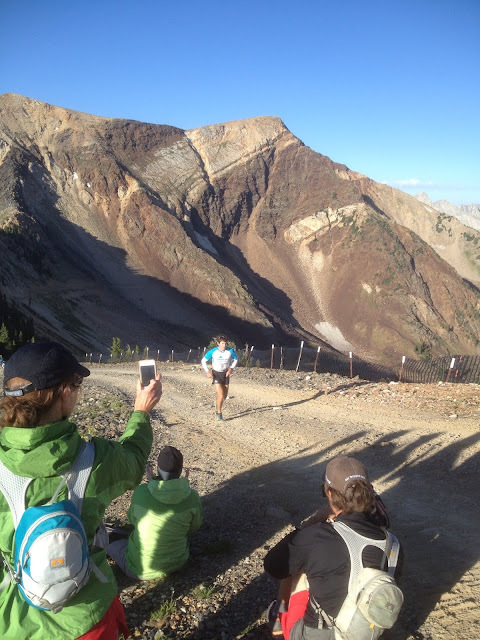 Part of the SkyRunning World Series this 12,000 vertical foot pain fest attracted top international mountain running stars such as Killian Jornet of Spain and Anna Frost of New Zealand to the Wasatch. Never much one for spectating I decided that I would climb up onto the course to catch the action. 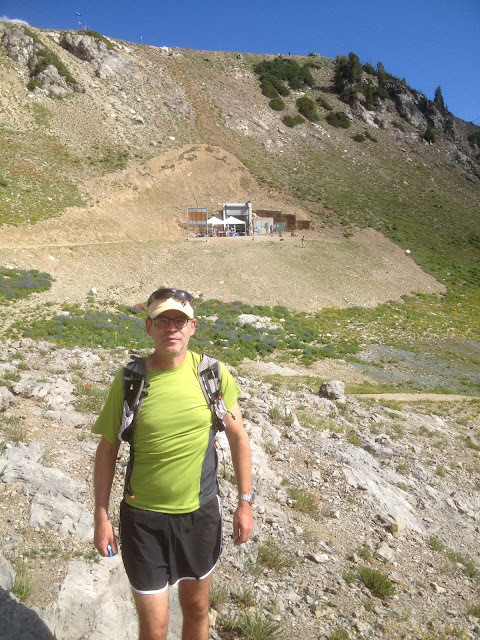 I got quite a workout in climbing the 3200 vertical feet to Hidden Peak and back down. The racers, well, they did far more vertical on a beautiful, warm day. 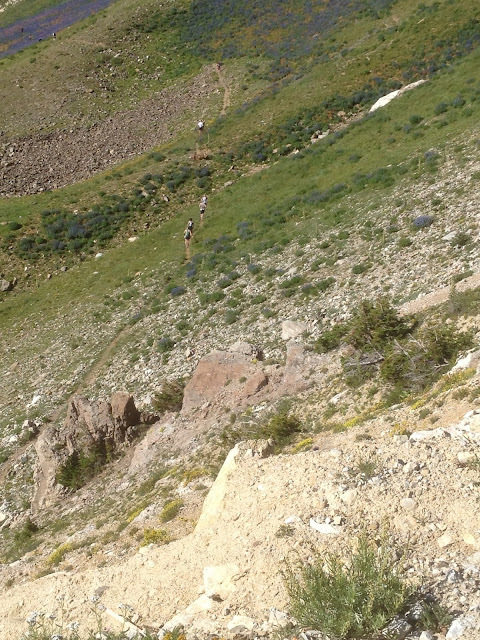 Complete race coverage at irunfar.com. Jason Louttit comes over Hidden Peak in 3d. He would finish 9th. Max King, World Mountain Running champ, Olympic track and marathon Trials qualifier comes over Hidden Peak in 4th. He would finish 3d. 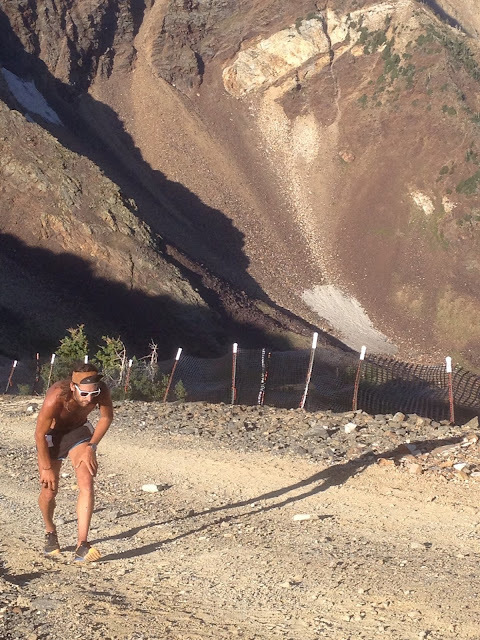 Anton Krupicka power walks over Hidden Peak about 5th. He would come in 4th. Of the top finishers he was the only one to power walk this section. Anna Frost NZ (Salomon) comes over Hidden Peak 1st Woman. 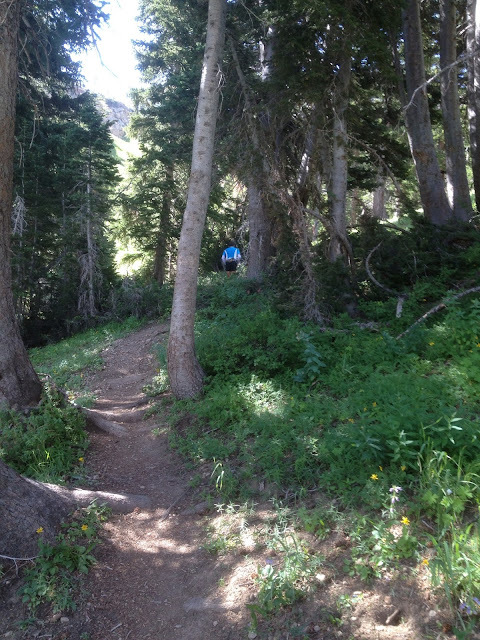 She combined power walking and running on this steep stretch to the peak. Waiting near the Tunnel aid station mile 23. After Hidden Peak runners descended into Mineral Basin and towards American Fork Canyon, way way down and then back up. Always nattily attired and totally wired (multiple iPhones, tripod, race radios) Bryon Powell (right) of iRun Far was all over the mountain reporting. Here he is coming down to the tunnel aid station at Mile 23. Killain Jornet approaches the Tunnel aid station at mile 23. I think he is reaching for a Salomon SoftFlask water bottle to refill. Photographer sprinted down with him from the Baldy saddle taking pictures all the way. 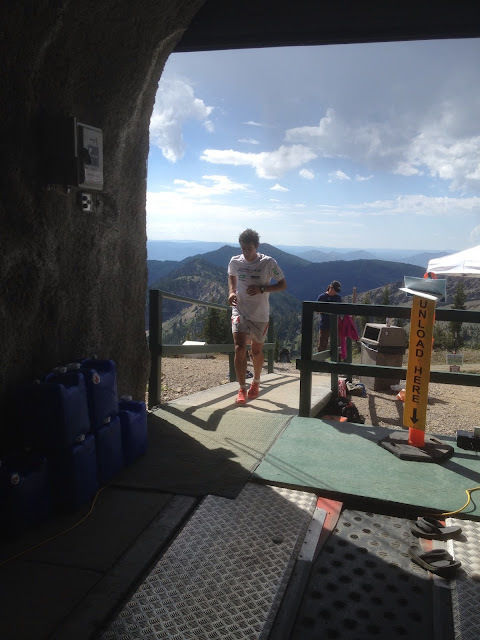 Killian enters the ski tunnel at about mile 24. After the tunnel a 1200 foot drop, then a 1600 foot climb back up to Hidden Peak. 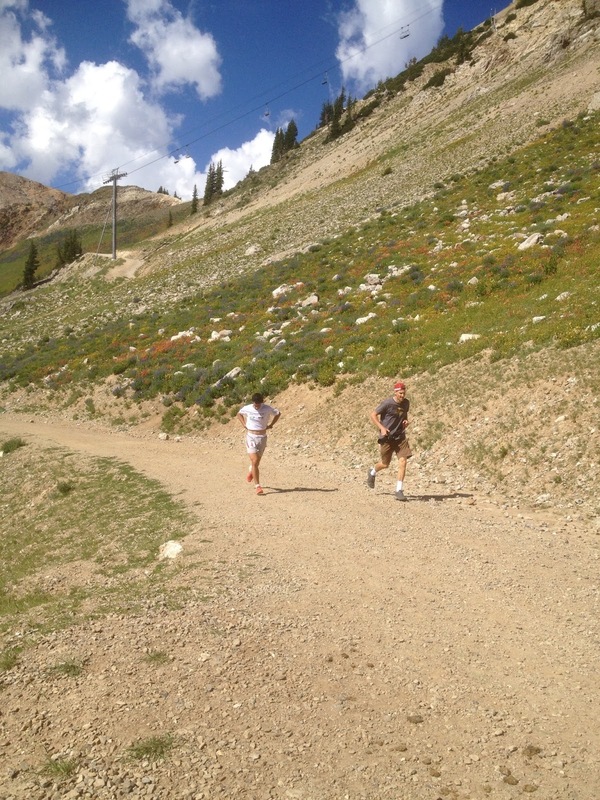 Then 3200 feet of downhill to the finish. 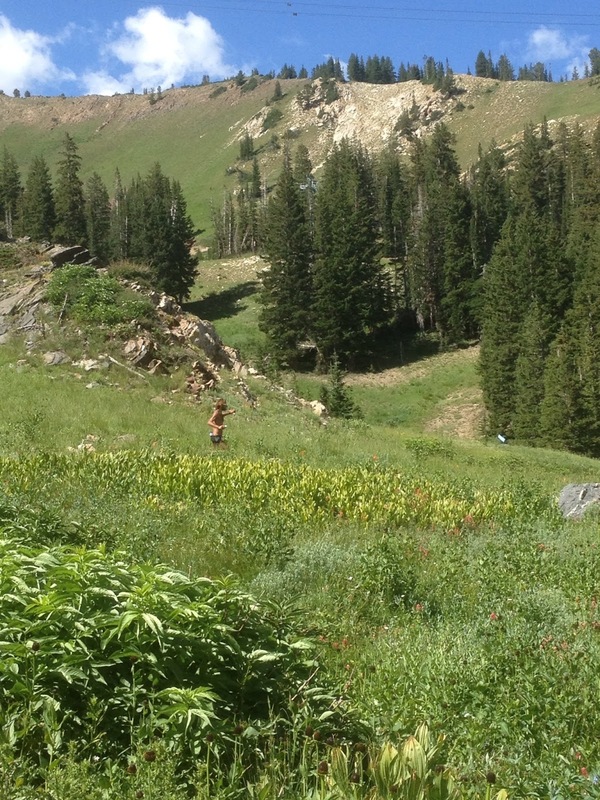 All of this after many miles in Mineral Basin. 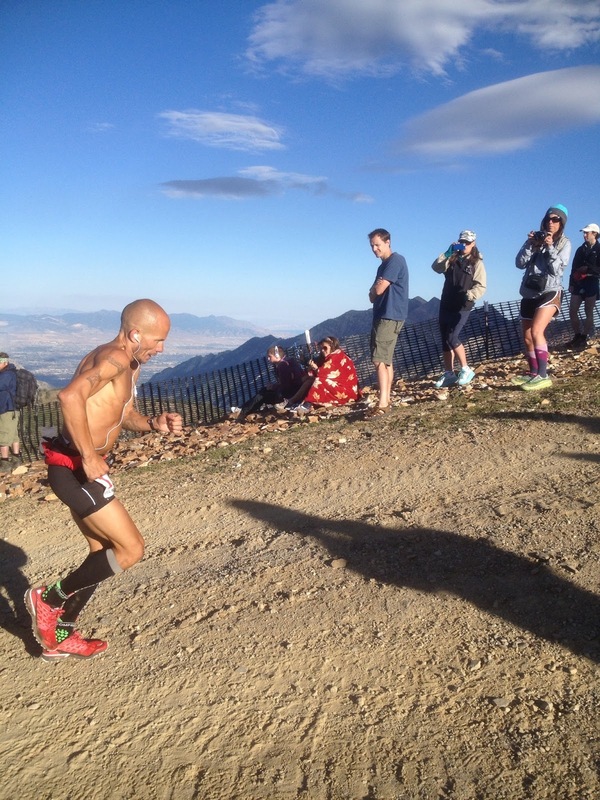 Killian Jornet (Spain) wins the Speedgoat. Stops before the finish to hi five some future runners. 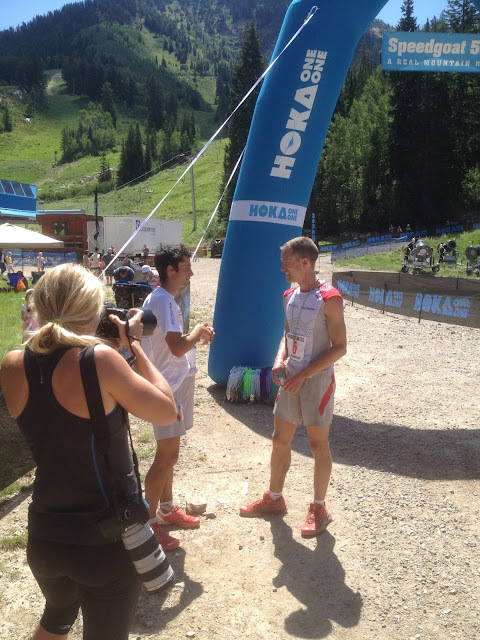 Killian Jornet 1st and Rick Gates 2nd at the finish. Both Salomon runners. Anna Frost New Zealand, 1st Woman. 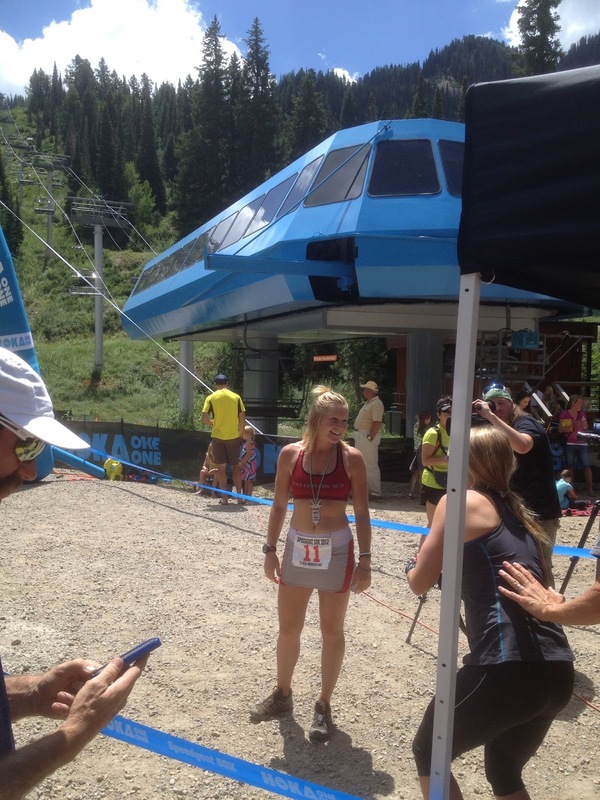 Her time was 17th overall and this running with some serious lower leg injuries. 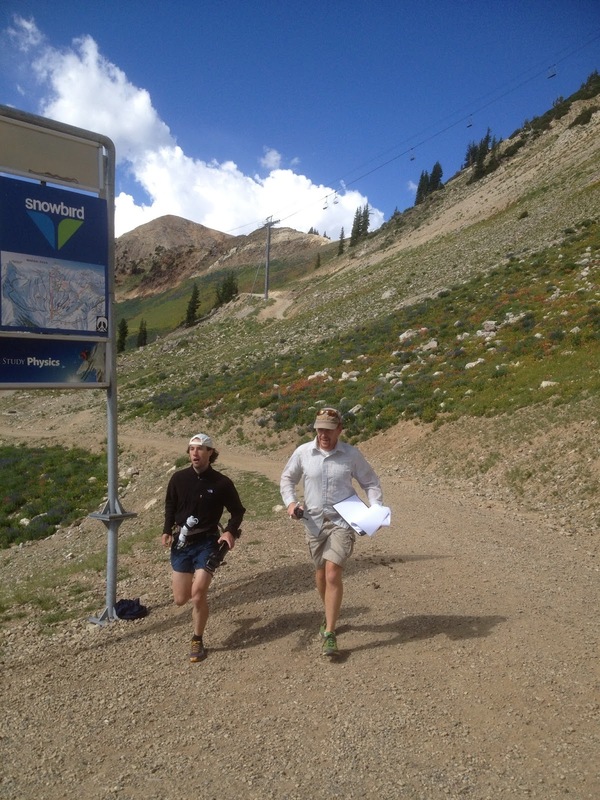 Anna Frost and race organizer Karl Meltzer discuss the watch. Karl probably ran twice as far as the racers. He enlisted me at one point to help remark the course.